This SOLID SEMI BLACK Opal is from the Lightning Ridge mining fields in Australia. Large rolling flashes changes through colours of red, orange and yellow. The crisp and very bright rolling flashes move over green, blue and purple that sits deep inside the high dome of the opal. Great in all lights. Note: Great in all lights. BONUS: BUY THREE OPALS AND WE WILL SHIP FOR FREE!!! This offer is for shipping via airmail, not including insurance. Purchases must be made within a 7 day period to qualify. Body tone: Thes is the colour of the opals body tone (or background tone) it can be black, dark (semi-black) or light opal. N1 is jet black through to N9 which is white. All prices are wholesale. 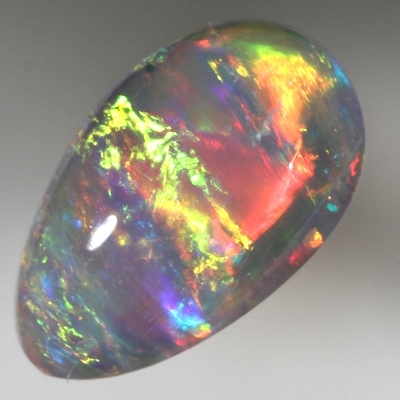 The opals we sell are natural SOLID opals and have not been treated or enhanced in any way.